The NIFTY50 continued with its losing streak on Wednesday as the benchmark Index closed further losing 47.20 points or 0.46%. What seemed to be a classical recovery in the first half of the session, turned highly disappointing as the Index lost over 125 points from the high point of the day. Volatility ruled the roost as the Markets modestly breached the 50-DMA support at Close but stayed within its filters. Caution weighed heavy ahead of Gujarat poll survey and Fed Interest rate decision wherein a rise of 25 bps is discounted for. Going into trade on Thursday, we might see the Markets attempting to stabilize an attempt to find some base again. The Markets have ended just a notch below its 50-DMA but has remained within its filter and has held the support zone of 10180-10200. We expect a modestly positive opening tomorrow and the levels of 10180 and 10110 will hold out as extremely important supports. The Relative Strength Index – RSI on the Daily Chart is 46.9237 and it stays neutral showing no divergence against the price. The Daily MACD continues to remain bearish while trading below its signal line. No significant formations were seen on Candles. 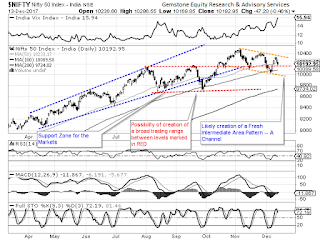 Pattern analysis shows that the Markets continue to drift downwards and remain in the falling channel. This falling channel is the intermediate trend created after the Markets marked the lower top of 10410. All and all, the NIFTY on Thursday will face little tricky situation. 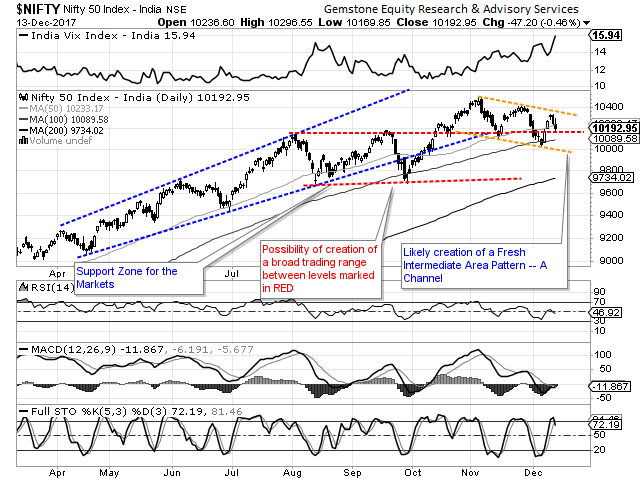 It would be of paramount importance for the Markets not to significantly breach the 10180-10200 support zones. If this happens, we will see some more weakness persisting in the near term. However, there is a silver lining in form of much lower-than-average volumes in the previous two declines that the Markets saw. Also, the shorts that exist in the system can lend support in case of extended weakness. Overall, we recommend staying away from taking any major exposure in the Markets and adopt wait-and-watch approach with a cautious view for the day.